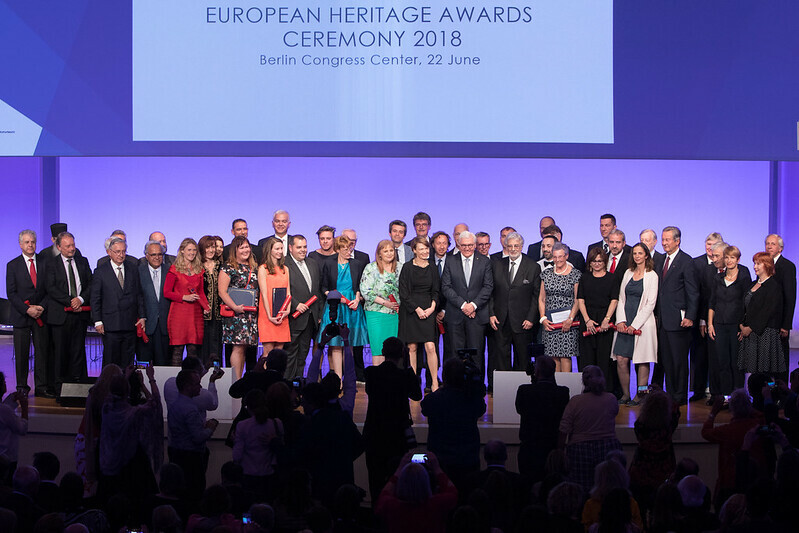 The winners of the 2018 European Union Prize for Cultural Heritage / Europa Nostra Awards, Europe’s top honour in the field, were celebrated during a special event in the evening of 22 June at BCC in Berlin. The European Heritage Awards Ceremony were co-hosted by Maestro Plácido Domingo, President of Europa Nostra, and Tibor Navracsics, European Commissioner for Education, Culture, Youth and Sport in the presence of the Federal President of Germany Frank-Walter Steinmeier. The best restoration projects, the most impressive research, the most dedicated heritage professionals and volunteers, and the finest awareness raising, training and educational programmes received Europe’s most prestigious heritage awards from the Juries’ Chairpersons of the four categories, respectively Koen van Balen, Etienne Poncelet, Álvaro Fernández-Villaverde y Silva and Goranka Horjan. During the ceremony, the seven Grand Prix laureates, entitled to receive €10.000 each, and the Public Choice Award winner, chosen from among this year’s winning projects, were announced. This major cultural heritage event assembled some 1.000 participants, including heritage professionals, volunteers and supporters from all over Europe as well as top-level representatives from EU institutions, Member States and the host country. The ceremony was preceded by the European Policy Debate, during which the Berlin Call to Action was presented. The Excellence Fair, during which the winners presented and discussed their remarkable achievements, took place on 21 June at the Allianz Forum in Berlin.